It’s been a long day friends – but it’s all been worth it cause I’m sitting at my laptop on Mackinac Island tonight! 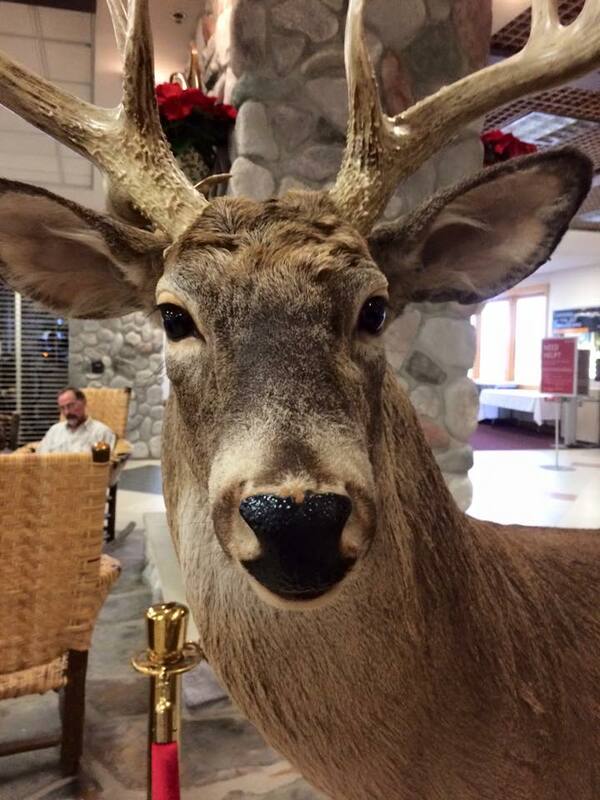 I arrived at the Pellston Airport 15 minutes EARLY and was met by Jill, Sue and this fellow (one of the permanent displays at the airport). We collected my luggage, jumped in Sue’s car, and we were off. 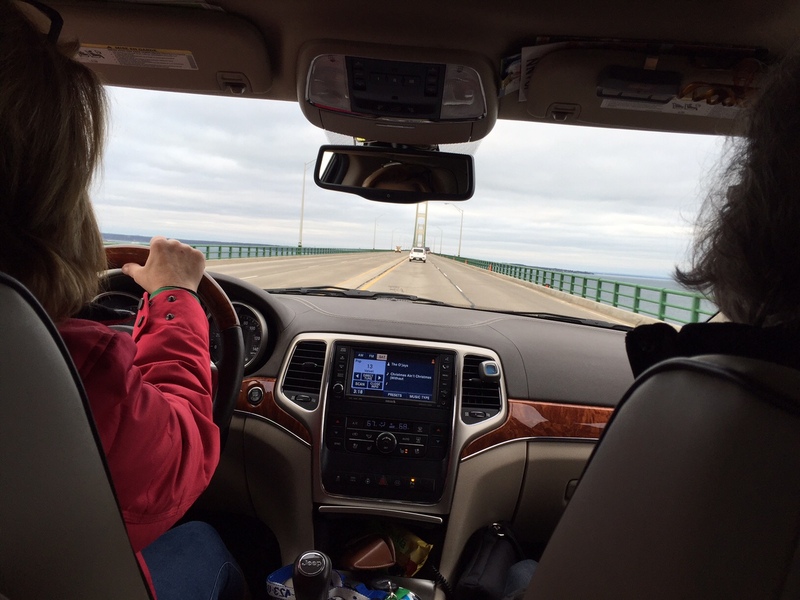 We made it to Mackinaw City, crossed the bridge and pulled up with minutes to spare to board the mighty Huron. 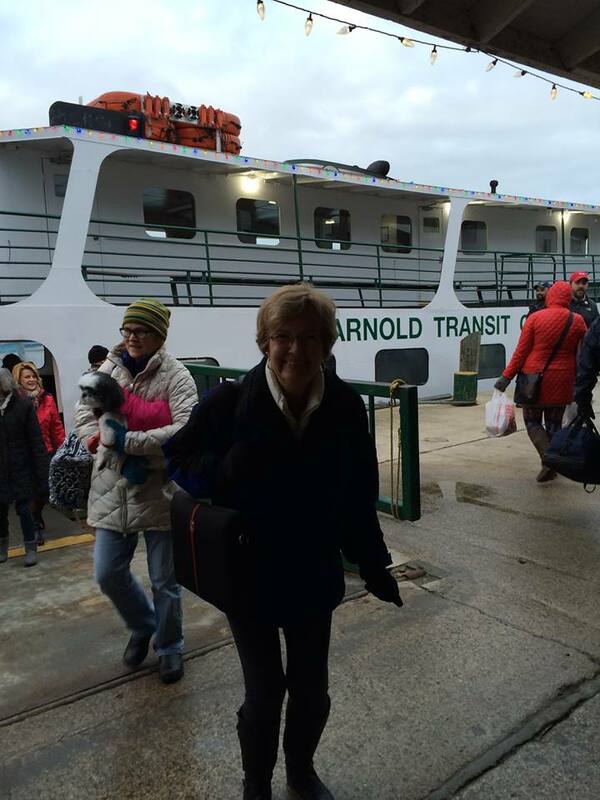 Friend Joan Barch met our boat, and snapped this pic of me when I first realized how COLD it was – full shudder mode! 39 degrees with a nice wind blowing. A big change from sunny Florida! Our first stop was the Original Murdick’s Fudge Shop where Murdick elves have been busy for days creating fudge and other yummy treats to send out across the nation. 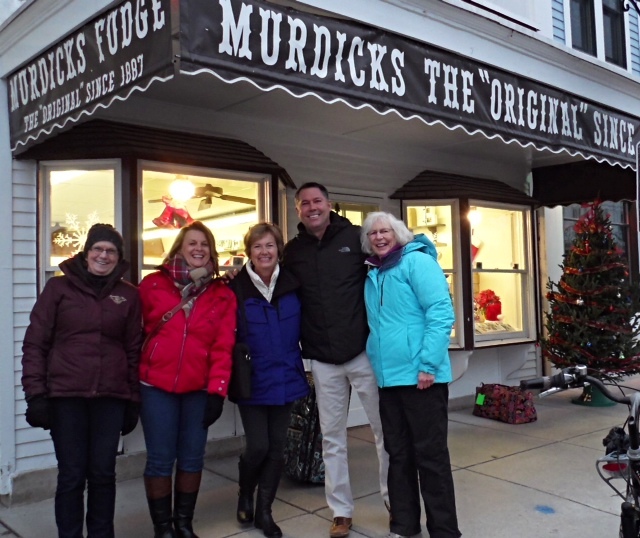 Jill took this photo of Leanne, Sue, me, Bobby Benser, whose family owns Original Murdick’s Fudge, and Joan. We got settled in and went to meet Sue’s son Patrick and Joan at The Village Inn for dinner. There are only two restaurants open in the winter – The Village Inn and The Mustang. Had a great meal and then headed back to the friend’s house where we are staying. 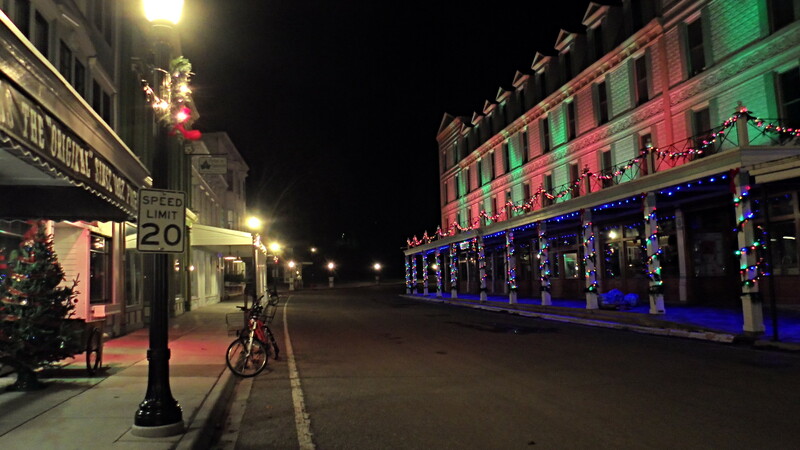 I love that even though the majority of the businesses are closed downtown, they’ve still decorated for the Christmas season – like Horn’s Bar . . .
. . . Little Luxuries of Mackinac Island. . .
. . . and the Chippewa Hotel (Photo by Jill). I’m sure there are others, but we didn’t venture off Main Street tonight. Tomorrow will be a full day, and I’ll continue to post little snippets from my iPhone. 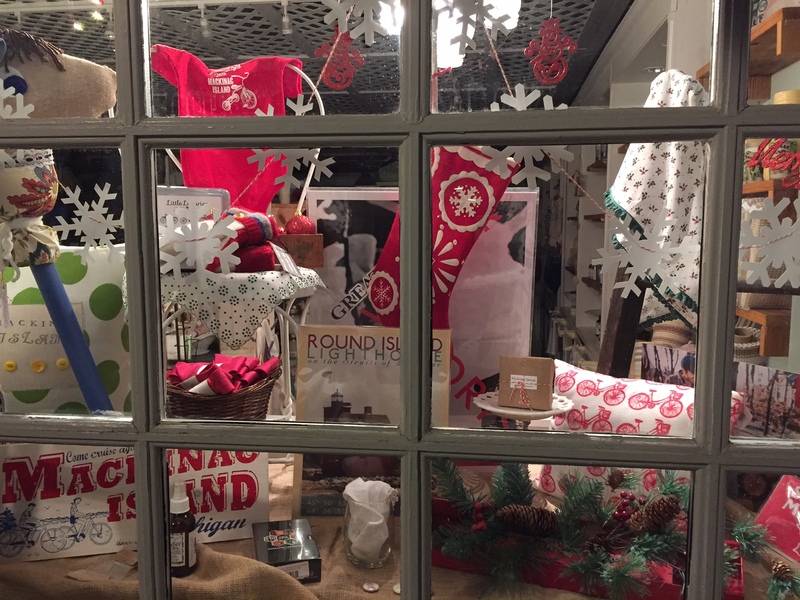 I’ll be covering all the activity at Original Murdick’s Fudge and everything going on for the Christmas Bazaar. 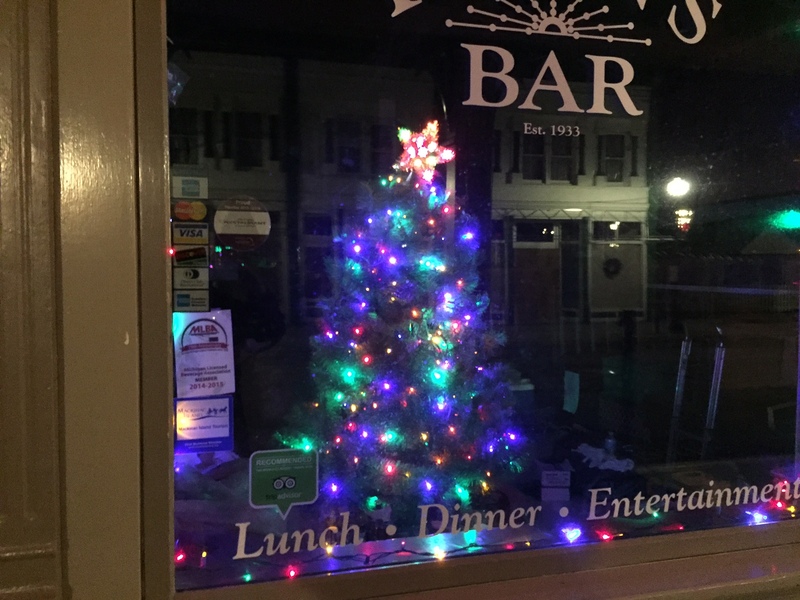 Tomorrow night is the Christmas Tree lighting on Main Street. If you go to the Horn’s Bar website and click on their webcam a little before 5:00 p.m., you should be able to watch the lighting from there. It’s going to be a great weekend, and I’m so glad all of you are along for the ride! Now this old girl is going to bed. It’s been a long time since 4:00 this morning!